Camilla Belle is one of those style stars who knows how to deliver great red carpet looks. She attended the Caruso's Palisades Village Opening yesterday evening(September 20th) at the Pacific Palisades, CA. 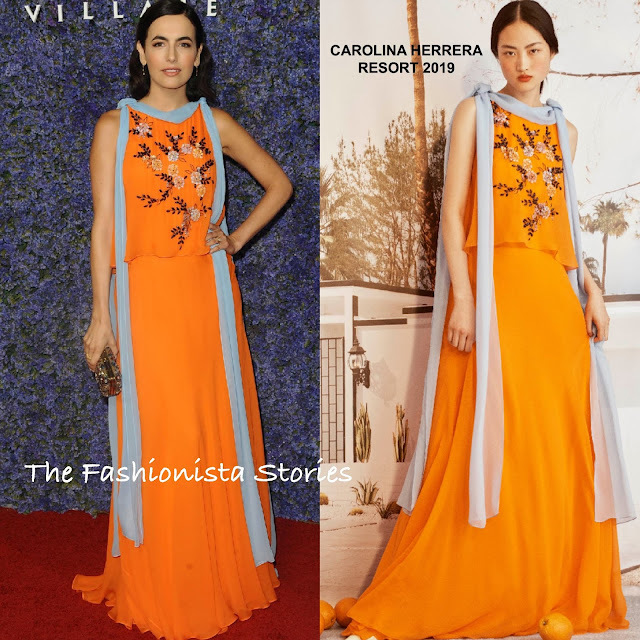 Camilla was easily my favorite at this event and a standout wearing this vibrant orange CAROLINA HERRERA RESORT 2019 silk-chiffon dress. Her dress featured a floral embroidered bodice and contrasting light blue silk-chiffon panels. To ensure that nothing takes away from her look, she went with a light makeup look and wore her hair off-the-shoulders. JENNIFER MEYER jewelry and a gold beaded clutch completed her look.